The L.L. Bean, Inc., Retail Store, Freeport, Maine. LL. Bean, Inc., an award-winning American mail-order and • clothing retailer, was founded over ninety years ago as a sportsmen's outfitter, selling waterproof boots for hunters. Over the years the company expanded into over three hundred product categories for men, women, children, pets, and the home—all with an ironclad guarantee. As the world's leading mail-order business, L.L. Bean's label stands not only for high quality, durable products, but for the satisfaction of each and every one of its customers. Leon Leonwood Bean (known as "L. L.") was born and raised in Maine. After his parents died, he lived with relatives in different parts of the state until he ventured out on his own. Although his education only went as far as the eighth grade, he later took business courses at local colleges and used this knowledge to earn a living. A lifelong lover of the outdoors, Bean often relied on his hunting and fishing skills to provide food. He married in 1898, fathered three children, and over the next decade or so struggled to support his family. As a hunter, Bean traveled in the woods in all kinds of weather and tired of always having wet, cold feet. In 1911, he decided to do something about it. He designed a sturdy boot and took the to a local shoemaker. Leather was used for the top and side parts of the boot and a thick rubber-soled bottom was added to keep feet dry and warm. The boot was called the "Maine Hunting Shoe." Pleased with the design's initial success, Bean formed a company in 1912, using his own name, to sell the boots to other hunters and fishermen in the area. Using mailing lists from the state hunting board, he mailed three-page flyers to men who had applied for Maine hunting licenses. He soon received several orders, and the L.L. Bean mail-order company was in business. Within months, the new company faced its first crisis. Customers complained that their shoes fell apart and water leaked in. Rather than ignore the problems, Bean offered his customers a full refund. 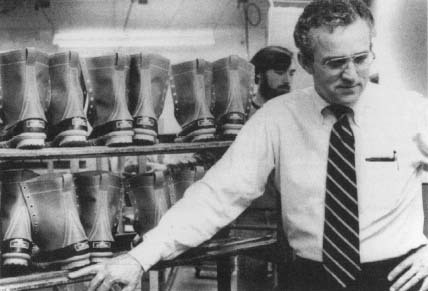 He then reworked the boots with help from a Boston rubber company and contacted his original buyers, telling them about the improved boot. Bean's insistence that he must provide clients with only the highest quality proved invaluable to the small company. It was the beginning of L.L. Bean's world famous promise: satisfaction was absolutely guaranteed, no matter what, or all money was refunded. Over the next several years, business grew steadily and a variety of recreational clothes and footwear was introduced. 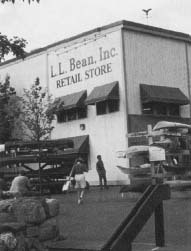 With the increase in sales, Bean was able to expand his one-room operation to open a manufacturing plant and office in downtown Freeport, Maine, in 1917. He then applied for both United States and Canadian patents on the hunting boot, to protect his design from imitators. A key factor to L.L. Bean's early success was the company's location. Perched atop Freeport's post office, Bean could pack up his shipments and walk downstairs to mail them. With the introduction of the parcel post rate in 1912, small packages could be shipped anywhere in the United States quite cheaply. An added plus was that Bean's brother was Freeport's postmaster. Maine Hunting Shoe is developed by Leon Leonwood Bean. L.L. Bean is formed in Freeport, Maine. Manufacturing plant and office opens on Main Street in Freeport. Employees number twenty-four; sales top $1 30,000. Company designs and sells boots to the military during World War II. Employees total over one hundred; Main Street store now open twenty-four hours a day. Bean's grandson, Leon Gorman, joins the family business. Founder Leon L. Bean dies and Leon Gorman becomes CEO. L.L. Bean enters partnership with Japanese companies. Company receives 150,000 orders per day; sales hit $4.5 million. On-line shopping service is launched. Sales climb to over $1 billion. Second L.L. Bean store opens in Maclean, Virginia. Third store opens in Columbia, Maryland; Chris McCormick becomes CEO. By the 1920s, L.L. Bean was earning a reputation among sportsmen as the best outfitter for camping, hiking, hunting, and fishing. In addition to a wide range of sturdy apparel, the company also began selling equipment, including canoes, tents, and fishing rods. The items were sold through the L.L. bean catalog or in the company store, which opened on Main Street in 1920. Bean's little mail-order company was a hit in Freeport and beyond, and the firm employed two dozen full-time workers by 1924. A shoemaker works on the leather uppers of L.L. Bean's famous Maine Hunting Shoe at the company's shoe factory in Freeport, Maine. L.L. Bean continued to grow and expand in the 1930s, with Bean writing and producing the company's well-known scrapbook-styled catalog. Featuring descriptive paragraphs written in Bean's folksy tone, his genuine love for the outdoors and L.L. Bean products came through on every page. The cover of the catalog always included an outdoor scene, painted by local and later famous artists who wanted to be a part of the L.L. Bean legend. By 1937, sales had reached a phenomenal $1 million. With the United States embroiled in World War II (1939-45), L.L. 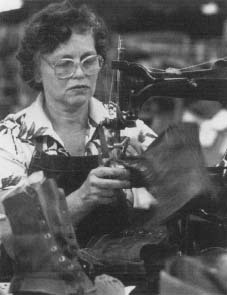 Bean contributed to the war effort by designing and manufacturing boots for the country's servicemen overseas. Different boot models, all based on the company's original waterproof Maine Hunting Shoe, were shipped to military posts. After the victorious end of the war in 1945, America was a happy, prosperous place, with growing families spending more than ever on recreational goods. By the beginning of the 1950s, the L.L. Bean store on Main Street was open twenty-four hours a day and the company employed one hundred people to service customers whenever they might need a fishing lure, waterproof boot, or hunting license. These patrons, mostly men but also a growing number of women, helped the company's sales climb to $2 million in 1951. To address the increasing number of its women fans, L.L. Bean created a department just for them in 1954. The 1960s ushered in a new age for L.L. Bean when grandson Leon Gorman joined the family business. Bean was in his late eighties, and although he had slowed down and was somewhat retired, he was still very involved in the company and the 100-page catalog bearing his name. Yet the aging founder knew it was time to groom his successor, and he chose young Gorman who had been taught well by Bean and his brother Carl (who had been helping run the company). Gorman took the reins of a company bringing in $4 million in annual sales the year his grandfather died in 1967. Although Gorman respected his grandfather's style of conducting business (such as never firing an employee or agonizing over failed products), he believed it was time to take L.L. Bean into the twentieth century. This meant applying the many technological advances that had become available and expanding into other areas, which his grandfather had not always favored. Leon senior had made all the money he needed, lived comfortably, and had often told his grandson, 'I eat three meals a day, I can't eat four." Yet to compete with its growing rivals, L.L. Bean needed to flex its outdoorsy muscles. LL. Bean offers a multitude of programs • and activities so that employees can become experienced and knowledgeable about the outdoors. Programs include Fly Fishing School, which is a three-day course, and three yearly "outdoor experience days." L. L. Bean's grandson, Leon Gorman. L.L. Bean's image. Many of the people who had mocked L.L. Bean's folksy appeal now embraced it as mainstream style. By the beginning of the 1980s, L.L. Bean sales were $140 million and mushroomed to $250 million by 1984. When the firm celebrated its seventy-fifth anniversary in 1987, not only was the L.L. Bean catalog still the mainstay of the company, with over seventy-five million copies mailed to customers annually, but the Main Street store had become a true tourist destination attracting some two million visitors every year to see the six thousand products displayed from wall to wall. Sales for 1987 surpassed $360 million, with nearly two thousand workers taking orders and selling merchandise. An important part of L.L. 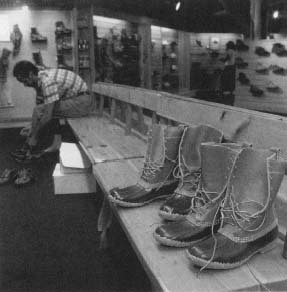 Bean's continuing success was its willingness to both sell and repair its merchandise, most especially its updated Maine Hunting Shoe, which became known as the Bean Boot. Customers could have their boots resoled for half the price of a new pair, and the firm repaired and shipped more than sixteen thousand pairs a year by the end of the decade. As the 1990s got underway, L.L. Bean was suffering from falling sales, soaring postage costs, and high returns. The once mighty retailer was considered dull compared to its competitors, which included Lands' End, Patagonia, and Eddie Bauer, Inc. (see entry). With newcomers crowding the outdoor and recreational market, the rustic L.L. Bean lacked the glamor and youthful appeal of its rivals, who spent millions on hip advertising in newspapers and magazines and on television. In response to sluggish sales, the company was forced to lay off some of its thirty-five hundred employees and stop production on a new manufacturing plant in Hampden, Maine. Yet Gorman was determined to turn things around. By 1992, he had installed new state-of-the-art equipment in the company's warehouses and factories, introduced more than two dozen "specialty" catalogs, remodeled the Main Street store into a huge three-story landmark, and formed partnerships with the Japanese, who were big L.L. Bean fans, to open new stores. L.L. Bean made several moves in the middle and late 1990s to ensure its future against rivals Lands' End and Eddie Bauer. In 1993, the company launched L.L. Kids with apparel and sports equipment for children. It also expanded its women's line, started a company Web site in 1995, and introduced an on-line shopping service in 1996. While the earliest Web site offered little more than product descriptions, it evolved into an informational site that featured over a thousand products, and offered background on the company, outdoor tips, and even a travel directory for national parks. Over the years, scores of the rich and famous confessed to being L.L. Bean fanatics, including such notables as diplomat Eleanor Roosevelt (1884-1962), author Ernest Hemingway (1899-1961), and baseball great Babe Ruth (1895-1948). Waterproof "duck" boots sit on a bench in the fitting area of the shoe department in the Freeport, Maine, L.L. Bean store. original Freeport store, a second retail store opened in Maclean, Virginia, and a third in Columbia, Maryland, along with several outlet stores. There were plans to open additional retail stores in the north and eastern parts of the United States, to give customers more of a chance to see L.L. Bean products up close. "We've seen catalog companies expanding into retail over the past few years," Stephen Berman, an analyst at Kurt Salmon Associates told Women's Wear Daily back in June 1999. "It's an opportunity and a vehicle for those businesses to reach additional customers who aren't necessarily comfortable not touching and feeling the merchandise." L.L. Bean was following the same formula in Japan, where the number of retail shops had grown to twenty. In addition to opening more stores, L.L. Bean lent its name to something entirely different: a sports utility vehicle (SUV). Forming a partnership with Subaru, the new Outback Special L.L. Bean Edition SWV hit the road in 2000 and was competing with Eddie Bauer's Limited Edition Ford Explorers and Expeditions (see Ford Motor Company entry). Other new directions included launching the L.L. Bean Home Collection and women's skin-care line. Along with new product launches and a spiffier image came a new CEO in 2001. After thirty-four years of running the company, Leon Gorman turned L.L. Bean over to a non-family member, Chris McCormick. "The family is comfortable with Chris," Gorman told the Boston Globe in May 2001. "The core traditions of L.L. Bean are in good hands." Gorman remained chairman of the board, while McCormick handled the duties of chief executive and president. L. L. Bean has been known to personally deliver items promised for Christmas or special occasions. In 1996, an entire Federal Express 747 airplane was filled with late-arriving toboggans and flown around the country to ensure that kids received them before Christmas day. McCormick had been with L.L. Bean for eighteen years and was well qualified to carry on the firm's long tradition of filling the needs of the outdoor and leisure markets. One thing, however, would never change: the L.L. Bean unconditional guarantee. Customer service would always reign supreme at L.L. Bean. Strauss, Levi Bean, L. L.